Aktin Diagnostik was foundet in 2006. Since then I offer professional diagnostics in lactic acid tests, coaching athletes (specially road cycling, mountainbiking and running) and bike fitting. 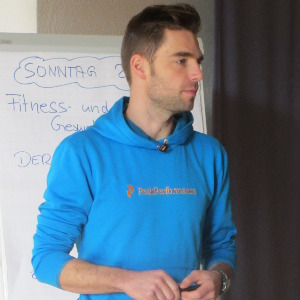 My name is Philip Scheller, born in 1978, I finished university by studiing sport science in 2004. In 2006 I started my big project "Aktin Diagnostik". Allready during study I focused myself on performance diagnostics and biomechanics. And thats exactly what I´m doing until today: offering diagnostics and coaching from one athlete to another. I call myself a typical multi-sports athlete: from biking to cycling, from swimming to mountaineering, from slope skiing to paintball. I tried almost everything. But if there´s enough time I prefere to spend that on one of my bikes, if not I call running an effective alternative. Having done such different sports gives me a special view on coaching. I always try to transfer knowledge to get the best out of my clients. And I know very well what it means to be new in a sport or disciplin. If you still stay at the beginning, that might be important. Since 2008 I´m offering bikifitting services and I´m doing that with getting great feedback. Heartrate Measurement Equipment is obligate. PowerMeter is optimum. Success. Coach Philip Scheller has been notified of your message.